Rachel J Homes is thrilled to market this distinctive and impressive Extended Detached House arranged over three floors in the popular development of West Wick. If you need plenty of space for your family and want to be close to Schools, Transport Links, Shops and Amenities make sure this is on your list to view. The accommodation briefly comprises of Entrance Hall, Downstairs WC, Large Lounge, Dining Room, Large Kitchen/Family Room, Five Bedrooms, Family Bathroom, Master Suite to Top Floor with separate Wet Room including Freestanding bath and Walk through Shower, Enclosed Rear Garden, Garage and Parking. Added benefits include double glazing, gas central heating. If your are looking for a substantial forever home for a growing family make sure this on you list to view. Accompanied viewings - CALL NOW to book a viewing as this property needs to be seen to be fully appreciated. Composite door into hallway, solid oak flooring, radiator, doors off, under stair storage cupboard, stairs to first floor. UPVC Double glazed window to rear, radiator, low level W/C, pedestal was hand basin, radiator, consumer unit. Dual aspect double glazed window to front and side, two radiators, TV point, telephone point. UPVC Double glazed sliding doors and full length windows to rear, two Velux windows with black out blinds, UPVC double glazed window to side, range of wall and base units with granite work surface over and splash back, one and half bowl sink with mixer tap over, integrated dishwasher, space for fridge freezer and washing machine, inset gas hob with extractor over, built in eye-level oven and grill, vertical radiator, wall mounted boiler enclosed in cupboard, solid oak flooring. Radiator, storage cupboard housing hot water tank. 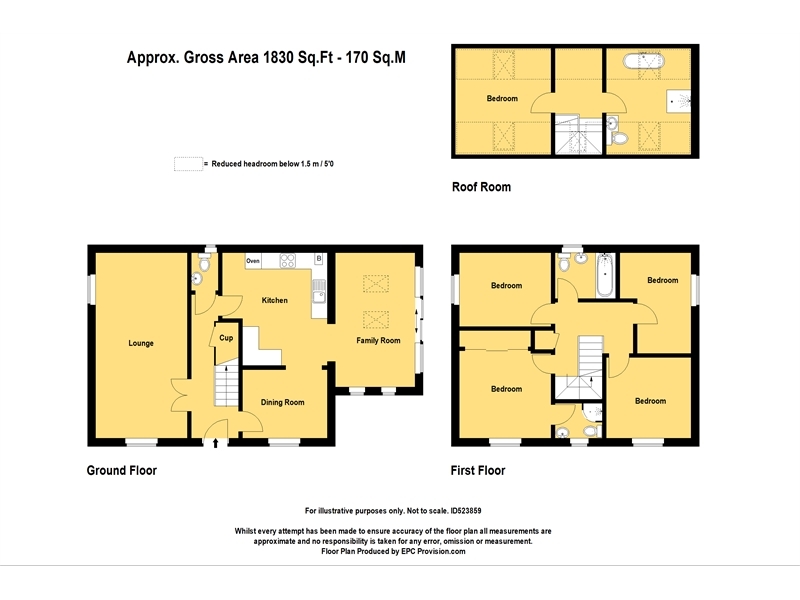 UPVC Double glazed window to side, fully tiled walls, shower cubicle with hot water double sun flower shower, low level W/C, wash hand basin set into vanity unit, tiled floor. UPVC Double glazed window to side, radiator, panel bath with hot water shower over, pedestal wash hand basin, low level W/C. Spacious landing with Velux window and doors to Master Bedroom and sperate Wet Room. Dual aspect Velux windows, radiator, eaves storage. Dual aspect Velux windows, fully tiled walls and floor, vertical radiator, low level W/C and wash hand basin set into vanity unit with mood lighting, open shower with double sunflower hot water shower with touch controls, touch screen smart mirror, free standing egg bath with waterfall tap and hot water mixer shower.